One household chore that I really despise is bathtub cleaning. This is one of the worst jobs, in my opinion. I have learned though that if I keep up with cleaning it, keeping it clean is much easier. Here are some tips for you to help you keep yours clean. I have learned that once I get my tub cleaned, I need to keep up with it. Therefore, the first step is to get the tub cleaned out perfectly. To do this, I recommend using gloves, a cleaner and an SOS pad. The cleaner that you use should be one that works well for you. I have found that cleaners like Comet or Softscrub with Bleach work best for me. I alternate with these depending on which one I happen to have on the day that I clean my tub. To begin, put the gloves on and remove everything from the tub. This means that you should take out all of the bottles of shampoo, conditioner and soap. Set all of these things out of the way and then rinse the entire with water so that it is wet. Pour some of the solution in the tub. I like to start at the top and work my way down, so I always begin with the sides of the tub. Scrub with the SOS pad and watch the soap scum and stains disappear. When the tub is completely clean, rinse it out thoroughly and then dry it with a towel. 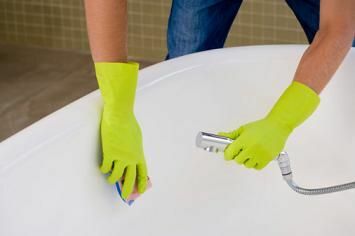 Every couple of days, you can touch it up and your tub will stay cleaner for longer.